I'm going to double down on demand creation when all my peers are holding off on R&D. 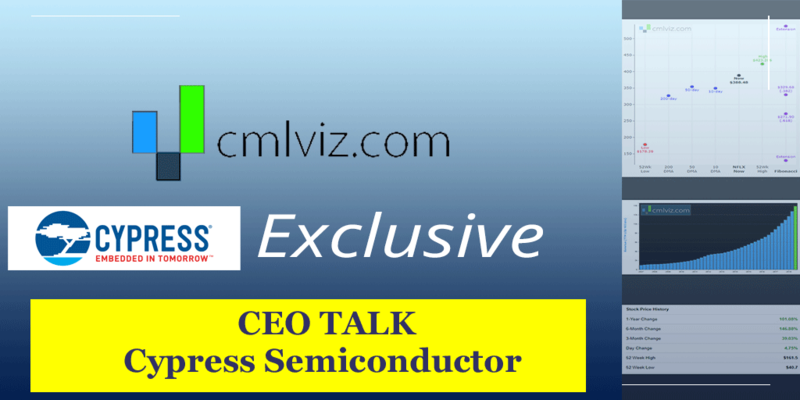 Shares of semiconductor maker Cypress Semiconductor (CY) rose fractionally in late trading on Thursday, to $12.11, after the company reported Q3 revenue and profit that topped analysts' expectations, but offered an outlook for this quarter well short of the consensus, reflecting softness in the chip market that has been discussed by others this week, such as Texas Instruments (TXN). Despite the lower outlook, El-Khoury said in an interview with Capital Market Laboratories (CMLviz) following the report that he's confident the company's diverse use of its manufacturing facilities would keep the company's profit margins intact even in a protracted period of industry weakness. Cypress announced a joint venture with South Korea's SK Hynix (000660KS) for the NAND giant to take over Cypress's own NAND portfolio, reducing Cypress's exposure to a commodity business. To recap, Cypress's revenue rose by 11%, year over year, to $673 million, yielding EPS of $40 cents. Analysts had been modeling $670 million and $38 cents. For this quarter's outlook, the company projects revenue in a range of $585 million to $615 million, and earnings per share of 31 cents to 35 cents. That is below consensus for $644 million and 35 cents. Gross profit margin was a star of the show, rising 3 points, year over year, to 47%. El-Khoury pointed out that even with a lower-than-expected outlook for this quarter, growth for the full year will be 7%, "still in line with our long-term plans," he said. Everyone gets worried about the softness. Our strategy is sound. I'm going to double down on demand creation when all my peers are holding off on R&D. We have the product and the execution muscle, we have a very well thought out strategy, and the fact that we're seeing the softness, well, we're going to stay the course and control what we can control. Cypress founder and former CEO TJ Rodgers was famous for the remark "real men have fabs," and it seems the use of the fab is still a key element in that strategy. El-Khoury pointed to the high "utilization" of the company's chip-chip-making facilities, noting that utilization is at 83% currently, just below the 85% utilization level that is considered "full" use of the facilities. He credited that to having "a very versatile fab." Whereas three years ago, the factory was "only on memory," making just memory chips, "today, it's memory, it's USB-C [wired connectors], and it's micro-controllers - all in that fab." The diversification of the factory means greater flexibility, he said. "That gives you, a lot of headroom, a lot of ways to pull things in on multiple of product lines." Asked if the utilization, and the margins, can hold up if the current soft patch becomes much more pronounced, El-Khoury said, "there's a threshold, obviously, but I don't see us getting to that threshold because I'm always moving to more and more things." He was referring to Cypress's expansion into various parts of the "bill of materials" in its markets. For example, where Cypress's second-largest source of revenue, automotive, already consists of two businesses, the "instrument cluster," what El-Khoury calls the "modern dashboard"; and dual-band WiFi transceivers for streaming video from the cockpit to the rear seats of a car. To that, the company is adding "body electronics," which will start to become meaningful in revenue terms toward the end of next year. And a fourth business, in "advanced driver-assistance systems," or "ADAS," is the company's "NOR flash" chips, called "Semper." This product takes Cypress's existing NOR flash parts and weds them to an ARM micro controller. For the joint venture with Hynix, Cypress is handing over its portfolio of NAND flash to the Korean manufacturer in return for 40% of the venture. Cypress expects to see handsome free-cash flow from the deal, while reducing exposure to a business whose gross profit margin is expected to fall to as low as 20% in coming quarters. The JV, to El-Khoury, is an example of the company's ability to course-correct when necessary. Asked what future adjustments to the portfolio he might make, El-Khoury, said, "you'll just have to wait till we announce something." If you want to win, you need to have the right data, at the right time, and it needs to be accurate. You need access to the same information that the top 0.1% has kept away from the rest of the world. You are on the better, smarter, faster version of finance portals like Yahoo! Finance. We are breaking the information asymmetry, and we're doing it right now.